By Michael Collins: Unbeaten British and Commonwealth heavyweight champion David Price (14-0, 12 KO’s) not surprisingly destroyed a well past his prime 40-year-old Audley Harrison (28-6, 21 KOs’) in the 1st round tonight at the Echo Arena, Liverpool, Merseyside, United Kingdom. Price hurt Harrison with a straight right hand that didn’t look like it was thrown with a lot of power or speed. It was more like a jab than anything. However, Harrison had his head turned sideways for some reason and the shot hurt him. Harrison then foolishly backed up to the ropes and just stood there while Price unloaded on him with everything but the kitchen sink. After getting hit with one especially hard right hand, Harrison fell down just as the referee jumped in to stop the slaughter. After the fight the British media seemed to be making a big fuss out of Price’s victory, pouring the compliments over his head endlessly without thinking about who Price just beat. 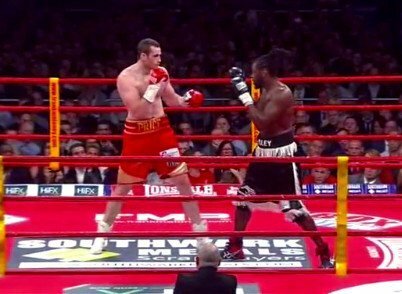 This was Audley Harrison who had already been exposed by the likes of David Haye and Martin Rogan among many others, and it wasn’t much of a victory. The question is why is a 29-year-old former Olympic bronze medalist like Price still being matched the likes of Harrison? Does Price’s promoter know something about his chin that other fans don’t? If his chin is okay then Price should have been WAY past guys like Harrison years ago. Price is wasting too much time in his career facing fodder opposition instead of quality. I’d like to see Price step up several levels and face EBU heavyweight champion Kubrat Pulev next instead of another local Brit fighter for him to pad his record on. Unfortunately, 45-year-old Matt Skelton, who fought on tonight’s card, is being considered for Price’s next fight. After the fight, Price’s promoter Frank Maloney offered Tyson Fury a fight with Price. However, that’s not likely to happen.